Ireland would be the worst-affected country in Europe in the event of a no-deal Brexit with fears for the economy and potential job losses. And while all sides in the Brexit talks say they want to avoid a hard border in Ireland, it remains to be seen how this will be done. How would a no-deal Brexit impact on Ireland? The effect of the UK crashing out of the European Union without a deal could be devastating to the Irish economy. In recent weeks the International Monetary Fund (IMF) has warned of 50,000 job losses and a 4pc drop in economic output. Ireland would be the worst affected country in Europe with the exception of Britain itself. All sides in the Brexit negotiations have said that they want to avoid a hard border in Ireland to protect the peace process and ensure frictionless trade on the island. But the question remains as to how this will be done, particularly in the event that there’s no deal. The Irish government claimed in December that it got a “cast-iron” commitment from the UK in December for a ‘backstop’ that would avoid border posts even if an overall deal between the UK and EU doesn’t materialise. The backstop would involve regulatory alignment on both sides of the Irish border to allow for smooth trade on the island. This commitment has looked shaky and will be the focus of much of the Brexit negotiations in the coming weeks. 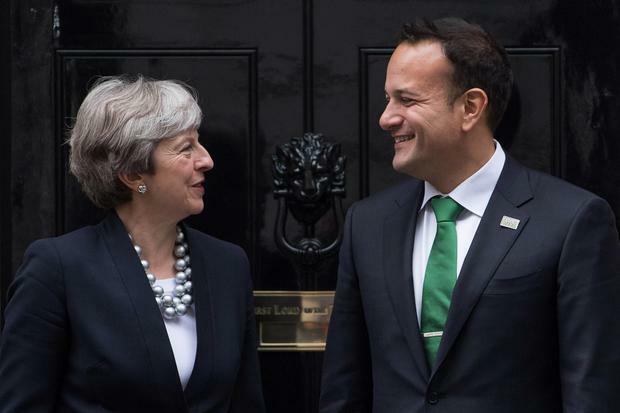 Theresa May last month repeated the British government’s opposition to a ‘backstop’ that would effectively see a trade border along the Irish Sea under a no-deal Brexit. In a speech in Belfast she reiterated her goal of avoiding a hard border on the island of Ireland by reaching an overall Brexit deal with the EU. The EU’s Brexit negotiator Michel Barnier last week adopted a conciliatory tone towards Britain when he signalled a willingness to be flexible in talks around the Irish border. However, he also warned the UK that a backstop solution is necessary for a withdrawal agreement. EU sources insisted that the backstop has to prevent a hard border. What is the threat to the agri-food sector here? Much of Ireland’s agricultural produce – particularly dairy and beef – gets exported to Britain. An EU report last year predicted that a worst-case scenario Brexit would cost the agri-food sector a staggering €5.5bn in lost exports. The study by the European Parliament’s Committee on Agriculture and Rural Development said the expected impact on Ireland is “particularly concerning” with the Irish agri-food sector “highly dependent on trade with the UK”. What contingency plans are the Irish government putting in place for Brexit? He said the government also reiterated that it “would not countenance a return of a border on the island under any circumstances, including in the event of a hard Brexit .” A government statement said that, to date, more than €450m has been allocated in business supports for Brexit. Among the announcements were plans for around 1,000 new customs and veterinary inspectors by 2021. There is to be upgraded infrastructure at Dublin and Rosslare ports that will require “significant investment”. The Irish Independent today reports that a new post-Brexit shipping route will see Ireland connected to Europe via the Netherlands and Belgium under EU contingency plans. The realignment of the EU’s strategic transport corridor is part of an effort to allow Irish trade a means of circumventing UK customs checks post-Brexit and to find alternatives to the land-bridge over Britain. But what about Britain? What will happen if Britain and the EU fail to get a deal? EU tariffs are quite low, averaging about 5 percent, but they are higher for some important British exports including cars which would face a 10 percent tariff. Exporters could face other barriers including complying with EU standards for goods such as food and electrical products. British exports might get stuck at the EU border. Many British services firms, especially in the giant financial industry, would probably face more restrictions on doing business in the bloc than under May’s preferred deal. Under WTO rules Britain and the EU could not offer each other low tariffs, quick border checks, or close cooperation on services, unless they offered these to all WTO member states. What’s the downside of a no-deal Brexit for Britain? The National Institute for Economic and Social Research says a no-deal Brexit would cost each person in Britain 800 pounds ($1,030) a year more than the effect of a “soft Brexit” under which Britain had ties to the EU similar to Norway’s. May’s plan would cost 500 pounds per person a year more than a soft Brexit. The impact on Britain’s economy could be bigger still if business investment falls, aggravating slow productivity growth, or a fall in migration causes labour shortages. Brexit supporters argue that WTO rules would help Britain’s economy by making it easier for London to strike its own trade deals with faster-growing countries and regions beyond Europe. However, this would take years and Britain on its own might struggle to secure favourable terms from the likes of the United States and China. Ruth Lea, a pro-Brexit economist, said the concerns about border delays were overblown, because countries outside the EU typically declare their exports online to speed their passage. Brexit backers also say Britain could save its estimated EU divorce bill of around 39 billion pounds and spend this on public services instead. Will a no-deal Brexit mean chaos in Britain? With less than eight months until Britain leaves the EU, time is short to negotiate an agreement or prepare both sides for the possibility of no deal Any disorderly Brexit risks delays at borders as officials struggle with a sudden introduction of new customs rules. Britain’s government is drawing up plans to stockpile medicines and blood products before a possible no-deal Brexit. In the worst-case scenario, Britain would fall out of EU arrangements such as the U.S.-EU aviation Open Skies agreement, possibly causing transport chaos. Financial derivatives trading would face legal uncertainty. EU citizens in Britain and British citizens in the EU would risk losing residency and other rights. Given the potential for disruption, the EU might offer to extend the Brexit negotiation period if there were some prospect of a deal, Malcolm Barr, a JP Morgan economist, said. “The EU knows that a no-deal Brexit would hurt all involved and would be an enormously complex problem to manage,” he said.